Jack Kennedy was never a great student: not in boyhood, or prep school, or college, either. He'd always read voraciously - English was his best subject - but mostly, he mucked around. Playful as a child, prankish as a teen, by college he was full-out in pursuit of pleasure - and, in the words of The Crimson, "a typical Harvard glamour boy." But even then, beneath the dazzling fun, was an homme sérieux. It only took traveling throughout Europe, Russia and the Middle East in the angry, anxious spring and summer of 1939, to bring him to life. By fall, Jack Kennedy had figured out what he wanted to learn, and late at night, usually, and by himself, he did the work to learn it. That experience formed the basis of his answer, here, to a student's question: "What college curriculum would be most beneficial for a political and legislative career." Listing then, in reply, that which he thought important to know and invaluable to do, he quietly stated what was "most essential" to have - and in so doing, revealed the key to his spectacular rise and success: a thorough knowledge of English. I believe the most important college courses would be in the government and economics fields; however, I also feel that a thorough knowledge of English is most essential. Obviously, if post-graduate work is to be done, the study of Law would be most helpful to you in getting a firm foundation for a legislative career. To supplement this, I would suggest that a young man of your ambitions and interests would certainly derive invaluable experience from participating actively in the campaign of a candidate whose program and integrity he can enthusiastically endorse. In this way, you can gain an understanding of the actual workings of politics which is unobtainable in any other way. JFK's own primal understanding of political life, however, did not come from participation in it. It came from books. As a "little boy sick so much of the time," his wife believed, "reading in bed, reading history ... reading the Knights of the Round Table", proved formative. Books brought him comfort, and their heroes, a hopeful prospect. But it was not until he saw, almost literally, Hitler's tanks rolling into Poland, that reading become something more. In wanting to understand the current crisis, he began to read seriously about politics - and as if driven, to write about it. "His typewriter would go a mile a minute", the wife of his Harvard residence hall janitor remembered. "He used to come home at eleven o'clock, twelve o'clock at night, it would be all quiet around there and then you'd hear his typewriter going a mile a minute." Kennedy's college thesis became a book, and the book, about England's unpreparedness for war - Why England Slept - a bestseller. 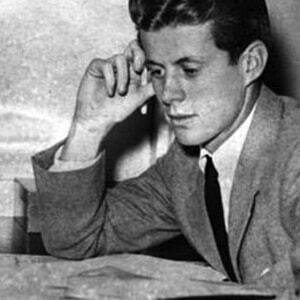 According to his college Yearbook, Kennedy intended to go on to Law School - and even took some pre-law courses at Stanford. But World War II intervened and he served in the Pacific instead. Returning home a hero, he ran for Congress in Boston in 1945, at the age of 28. That campaign was not only his first as a candidate but his first, ever, in any capacity. He worked, a friend said, "as close to twenty-four hours as a man can work." And he won. Kennedy would win election to the House three times, to the Senate twice, and the Presidency once, before being assassinated in 1963. Singular among his accomplishments, however, is one he held dearest: he is the only president ever to have won a Pulitzer Prize - in 1957, for Profiles in Courage, a classic study of U.S. Senators who risked their careers to fight for what they believed. This letter, happily, carries a figurative postscript. The young man whom Kennedy advised? David Braverman went to Penn in 1955, then Harvard Law. He became an eminent jurist, specializing in trusts and estates. And while he did not have a political career, he certainly had politics: he was fervently Republican - and a collector, too, of Nixon memorabilia. Typed Letter Signed, as Senator, 1 page, quarto, United States Senate, August 2, 1954. To David Braveman. Thank you very much for your recent letter in regard to your interest in my suggestions as to what college curriculum would be most beneficial for a political and legislative career. I believe the most important college courses would be in the government and economics fields; however, I also feel that a thorough knowledge of English is most essential. Obviously, if post-graduate work is to be done, the study of Law would be most helpful to you in getting a firm foundation for a legislative career. To supplement this, I would suggest that a young man of your ambitions and interests would certainly derive invaluable experience from participating actively in the campaign of a candidate whose program and integrity he can enthusiastically endorse. In this way, you can gain an understanding of the actual workings of politics which is unobtainable in any other way. I sincerely appreciate your interest in writing to me, and I hope these suggestions will be of value to you.